Linux has the penguin. MySQL has the dolphin. O'Reilly has a whole zoo. Every successful open source / open content project seems to have a mascot - should Wikipedia have a mascot in addition to the logo? The Wikipedia logo already beautifully conveys the earth itself, and diverse human cultures around the globe, as the "mascot" of Wikipedia. A different mascot would compete with the logo and dilute the value of the Wikipedia brand. If you want a mascot. It could be used in the logo, printed on T-shirts or kept as a housepet. But what should it be? A fish, a bird, an insect, a mammal, a reptile, a virus? This page is for collecting ideas. At any time, feel free to express your support for a particular mascot by putting your name under it. Suggested mascots This is en:Approval voting so you can add your name next to as many choices as you want. Rationale: I don't know if it's being used by another GNU project, but I really like an amoeba for mascot. It is chaotic, it is growing, becoming something that nobody could know cooperating with other amoebas, it could be infectious, curious and very social. Image: I don't have it, but I will like an amoeba with glasses. "Please do not add new options unless you get them seconded by one other Wikipedian." Sorry for not following the instructions. 203.129.195.132 12:15, 5 Apr 2005 (UTC) snoyes -- Maveric149 (compare en:centipede and en:millipede) -- Sannse -- Elian -- Enchanter -- Ducker -- ILVI -- Jazmin --- TakuyaMurata -- Marumari -- Stephen Gilbert (forget the bees; I want a Stevertigo-drawn Wikipede, baby!) -- MyRedDice (Stephen convinced me of the merits of this, and Stevert's sketch is just so cute) -- Ashibaka (haha, yeah) -- Nichtich -- Kwekubo -- aravindet -- Webkid -- Nanobug (yeah, bugs!) -- Stan Shebs -- Cjmnyc -- Angela -- Kalki -- Fantasy-- MattE -- Fuzheado 08:10, 7 Sep 2003 (UTC) -- CyberMaus (Converted bee-lover thinks Stevertigo's concept is super) -- Nolendil -- Dori -- Marley -- Jeff8765 -- 69.209.243.232 02:23, 7 Sep 2004 (UTC) User:Ilyanep (coming from a guy) such a cute sketch (the one to the right with the centipede reading the books caught my attention) Tmh --  -- Kraut1138 (the mate gourd really does it for me) -- ✏ Sverdrup 15:07, 12 Jan 2005 (UTC), Stevertigos concept is very good -- 194.158.209.57 23:23, 25 Mar 2005 (UTC) great -- Bobbyandck, very nice, I love the little mate in the hand in the bottom left, I wonder where comes the idea to put that, it is exactly that the drink I have when I want to study michael180 I like it -- [en:User:Philwelch|Philwelch] I prefer the  version, as it has that sort of Atlas connotation --Bjwebb 16:31, 25 Jun 2005 (UTC) I just love wikipede -- Adam78 beside the fact it's really cute, it would perhaps help make people realize the importance of resources Super Sam --User:Dario vet/Sign 17:46, 11 December 2006 (UTC) Original concept by Jay Bowks (User:ILVI) on the wikipedia mailing list (recognise the "W" shape): Holycharly 14:13, 8 September 2005 (UTC) - we French froggies had the same in the eighties at TV #2 (Antenne 2) which was a silly centipede that continuously lost its spherical components (it was a mongrel of 1000 of them). Liked it. -- LifeMega 19:23, 4 December 2005 (UTC) I love the Wikipede. The name sounds like Wikipedian, and the many arms represent the many people contributing. Naha Great play on words! It has so much personality and potential. It jumps right off the page! Owls and monkeys are already way overused as logos around the world. The ant just seems too plain. Lets be different! Rationale: legs co-operate, great (disarmingly cute) images. Controversial (not Disneyish). Very agile and can bend this way or that to get past obstacles. Centipedes will fight off bigger insects or spiders, will decimate cockroaches. Millipedes can roll themselves into a tight little ball when threatened and avoid injury and at times roll speedily away from danger. "wikipede" is a nice pun. Problems: negative/creepy connotations for some (see images above) - drawings are good though. Do they co-operate enough? Name "Wikipede" hard to internationalise. Rationale: Coyotes are curious (will investigate human activity when they roam into residential areas); controversial (farmers and ranchers tend to hate them but other people like them); growing (the range of coyote territory has expanded greatly in recent years and keeps expanding); cooperative (in the way they raise pups and hunt together to bring down animals they couldn't kill alone); ambitious in their search for food and in tackling animals much larger than themselves; and social in the way they vocalize to communicate with other coyotes and travel in packs. (You could also call them infectious, but coyotes don't get rabies as often as domestic dogs.) And yes, coyotes are very cute and good to draw. Problems: They sting. Some people are allergic and/or afraid of them. Not very cute (unless drawn cartoony as above). Done to death elsewhere? The 'honey pot' is in english. Bah. (*) Miwiki is an artwork of french workgroup on french Wikipedia. All products about Miwiki on fr:Utilisateur:Oliezekat/Miwiki and discuss fr:Discussion Utilisateur:Oliezekat/Miwiki. 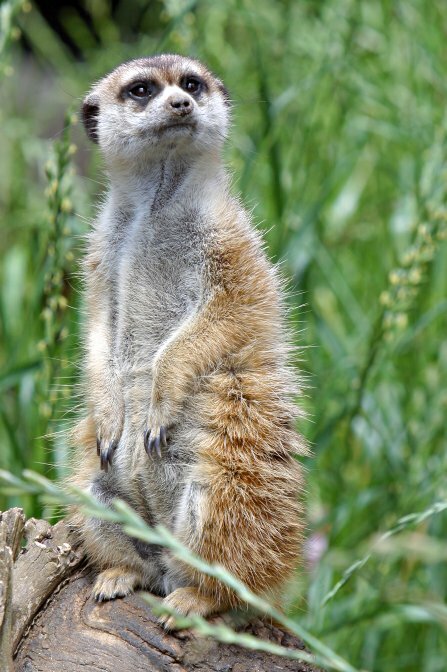 different problem The Lion King has a meercat... do we want Disney horning in on this? Rationale: There are mice everywhere there are Wikipedians. Reference to the Hitchikers Guide to galaxy. Problems: Wil Wheaton Dot Net uses a slogan based on this (although not a logo). He has actually already endorsed Wikpedia, see here. There used to be a monkey logo at Logo suggestions--humorous logos, however the images were stored offsite and have vanished. That one, along with most of the others, are back. If anyone has copies of the missing ones, please upload them. If the monkey is chosen, it would look best typing with its feet! Not only would it be funny (even funnier than a regular old monkey), it would be a good reason for explaining why Wikipedia isn't perfect. I think that the monkeys working on it would be a definite show of the collaboration in the process of creating the wikipedia. Of course, thousands of monkeys, in addition to writing shakespeare also produce a fair amount of crap. I don't really like the idea of having a mascot at all; I feel a photograph, such as the one given, would be better. It would function as a graphic illustrating the wikipedia, not some kind of cutesy mascot that makes it look unprofessional. I do not know about a monkey behind a typewriter for wikipedia but three monkeys fighting over one typewriter would be great for anarchopedia. [source for info on octopus www.germantown.k12.il.us/html/octopus.html [ first hit in google for octopus]but ideas already developed by me.] - Tmh I like that picture enough :) --65.172.213.123 16:44, 12 August 2005 (UTC)Octopi are cute! So I'm in! minus points- is there an element of cruelty in the catching of prey and tentacles? Octopus is like a spider. Google is using a spider. Spider collects information and octopus could do the same. But Wikipedia's mascot shouldn't be spider coz it's already used idea. Rationale: There are several species, but perhaps freshwater (river) otters might be the best choice. They embody all of the qualities listed above with perhaps special emphasis on playful and curious. The appearance and behavior is appealing at least to humans and other otters, and though rather incompatible with an orderly environment due to their playfulness and curiosity, they are not known to be vicious, hostile, or agressive. Regrettably, unlike centipedes or milipedes, they have only a few feet, thus not stressing the "...pedia" aspect of Wikipedia. Perhaps this could be remedied by adopting an appropriate name, eg Pede, the Otter? Public domain images, a la those used by O'Reilly Publishers for their covers might be appropriate, or perhaps a cartoon akin in spirit to that used for Tux (the Linux mascot) would be better. Artists are invited to have a go. The aspect to be emphasized in such a cartoon otter is a impish curiosity, with perhaps a touch of satisfaction at recent excellent meal of insufficiently quick fish or newly found understanding. Rationale: An old symbol for knowledge and searching for facts. An owl head could easily be integrated in the logotype. Maybe boring but respected and traditional. The eyebrows could form a W shape too. Problems: Encyclopedia.com and Wikinfo use a cartoon owl as their logos. Also, owls work alone. Rationale: It most resembles "an animal designed by committee"
Problems: The en:Darwin kernel uses a Donald Duck look-alike platypus named Hexley. Also, the Gnu has been remarked upon as an animal most likely built by committee, and it's an old free-software joke. Tillwe 20:11, 29 Sep 2003 (UTC) I like the above idea, looks like puzzle pieces are people holding hands... but I voted no mascot Pedant Something similar from Spanish Wikipedia, by Comae. spirit of Wikipedia social, cooperative, growing. Concept art. Imagine more of them scurrying about. Rationale: Social and massively cooperative. Busy, chaotic colonies. Not easily contained (can chew through concrete). A mammalian alternative to ants and bees. Sand puppy sounds friendlier than naked mole rat. Problems: Not cute. Nearly blind. El movimiento forma parte de la energía y de lo más íntimo de la materia: El movimiento es la energía y la materia. Todas las capacidades y expectativas del conocimiento humano permanecen ligadas a la idea de movimiento. La mascota que sugiero es la serpiente que mira una onda senoidal que representa el movimiento y al mismo tiempo la representa a ella misma. En la representación, la fusión de la serpiente con los ejes cartesianos sugiere la unión entre las líneas rectas y curvas, la cruz y la luna, es decir la herencia del conocimiento de occidente unido con la de oriente. Serpent, movement is part of the energy and most intimately of the matter: The movement is the energy and the matter. All the capacities and expectations of the human knowledge remain bound to the movement idea. The mascot that I suggest is the serpent that watches a sine wave that represents the movement and at the same time it represents herself. In the representation, the fusion of the serpent with the cartesian axes suggests the union between the straight and curved lines, the cross and the moon, meaning the inheritance of the knowledge of the West united with the one of east. Luke 17:5 (NIV) The apostles said to the Lord, "Increase our faith!" He replied, "If you have faith as small as a mustard seed, you can say to this mulberry tree, 'Be uprooted and planted in the sea,' and it will obey you." The Tardigrade is the strongest animal ever. Don't we want our ideology to be deathless? Don't have the image yet, but you can look about this animal here in wikipedia. El Tardígrado es el animal más fuerte de todos. ¿No queremos acaso que nuestra ideología perdure? Aún no tengo la imagen, pero pueden averiguar sobre este animal aquí en wikipedia. Rationale: Termites are co-operative animals. In some ways we are like them in our work on the House of Intellectual Property. They are so maligned that there is little chance that anyone has chosen them as a mascot before. Weasels are small cute and furry. Also inquisitive. William M. Connolley 11:06, 12 September 2005 (UTC). Support: 31 or so, judging from the commentary. I Like this mascotte, it's sweet and beautiful Ciny2 (Ciny2 on Italian Wikipedia). Best mascot better than Twitty's head coming out of wikipedia's head. This page was last edited on 15 July 2018, at 11:14.